There is a paucity of clinical data to support the hypothesis that external beam radiation therapy causes iatrogenic hypogonadism in prostate cancer patients. All prostate cancer patients treated at a single institution with radiation therapy between 2002 and 2010 were retrospectively evaluated. Patients treated with brachytherapy alone received 0 Gy of external beam radiation therapy and served as the control group. Patients treated with combination external beam radiation therapy + brachytherapy, or external beam radiation therapy alone were categorized into groups who received 45–54 Gy or > 60 Gy of external beam radiation therapy, respectively. Serum testosterone levels were routinely measured with prostate-specific antigen tests. The median follow-up periods for 149 evaluable patients in the control group (0 Gy), the 45–54 Gy group, and > 60 Gy group were 57, 62, and 55 months, respectively (p = 0.43). 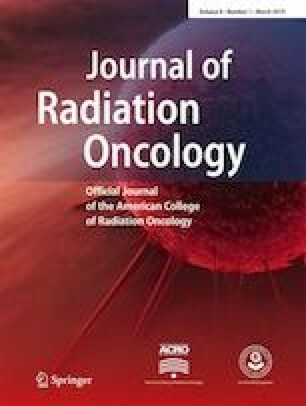 Among patients who underwent external beam radiation therapy, 53% were treated with intensity-modulated radiation therapy, 65% with pelvic lymph node coverage, and 78% with 18 megavoltage photons. There were no differences in serum testosterone level declines over time between the 45–54 Gy group (p = 0.32) or the > 60 Gy group (p = 0.14) when compared to the control group (0 Gy). While body mass index was associated with baseline testosterone levels in univariate analysis (p < 0.0001), it was not associated with the rate of change following radiation therapy (p = 0.6). Empirical evidence does not support the hypothesis that incidental exposure of the testicular Leydig cells from scattered photons and/or daily portal imaging affects testosterone levels. This material is the result of work supported with resources and the use of facilities at the Hunter Holmes McGuire Veterans Affairs Medical Center in Richmond, Virginia. The contents do not represent the views of the US Department of Veterans Affairs or the United States Government. This work was also supported by the Johns Hopkins University Alumni Second Decade Society. The work was supported by the Hunter Holmes McGuire Veterans Affairs Medical Center in Richmond, Virginia. The work was also supported by the Johns Hopkins University Alumni Second Decade Society. Matthew Williams, Emily Harris, Duncan Kilpatrick, Dr. Robert Adler, Dr. Wen Wan, Dr. Michael Chang, Dr. Michael Hagan, and Dr. Drew Moghanaki declare that they have no conflict of interest. The data presented here were part of a retrospective quality improvement project that had previously been reviewed by the Institutional Review Board and determined to not meet the definition of human subjects research as defined in Code of Federal Regulations. This article does not contain any studies with human or animal subjects performed by any of the authors.